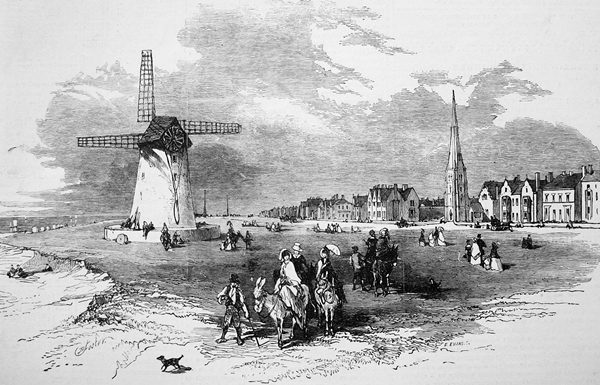 Lytham Windmill was built on the edge of The Marsh (now Lytham Green). Lytham windmill was erected on the Marsh about 1805. "The Marsh" may once have been a salt marsh but by 1800 it had long since been covered by wind-blown sand. It was an expanse of small sand dunes between the beach and Lytham village. When Lytham developed into a holiday resort the dunes were levelled and grassed over to form the present greensward. Lytham viewed from the beach c1904. The site was advantageous for the sea breeze required to drive the sails, and for the proximity to the sea, as grain could be transported along the coast and delivered almost to the door of the mill. This was often the most efficient way of transporting heavy goods due to the poor state of many roads at the time. The windmill had been erected by the local landowners, the Clifton Estate, and it was initially leased to Richard Cookson for 7/- per annum. Originally there was a kiln on the inland side, where the grain was dried before being milled. The sails were longer than those depicted by the artist in this engraving of c1842. The tips almost touched the ground on the surrounding plinth; and over the years this was the cause of at least three tragic accidents. On Saturday last a sad accident happened at Lytham windmill. Readers acquainted with the neighbourhood are aware that the sails of the mill revolve very near ground; and it appears that a number of boys were on Saturday playing about in childish bravado, trying how near they could approach the sails and avoid injury. At length, one of the party, a boy about six years of age, son of George Miller, the Preston carrier, made a false step, and the sails coming in contact with him, he was killed on the spot. By the 1840s, Lytham was fast developing as a health resort and substantial properties were being erected on the seafront. The noise from the windmill and the smoke from the kiln furnace were viewed as a nuisance by the new residents. The kiln was taken down and rebuilt at the East End of Lytham. Thomas Moore (b.1791) was the miller at Hoo Hill Windmill, near Blackpool, in the 1840s and then at Lytham Windmill in the 1850s. He lived in Market Square with his wife, Mary and son John (1831-1858). He retired aged about 71, by which time he was living in "Gas Street". Many a time have I lain on the sward at its foot listening to and watching the rumbling swift descent of its huge arms and the swish as they grazed the long grass growing on the platform or round terrace on which the mill stood and wondering whether it would be possible to grip hold of the ladder-like lattice of the arms and be whirled round and then let go at the right moment as earth was reached again. Our mother told us that the Clifton tenantry was bound to grind its corn at the mill and that all millers' horses were proverbially fat, but the miller seemed to us to be but a lean and surly sort of churl, who thought all boys were imps of Satan instead of being innocent little angel-lambs! Once or twice, however, when the mill was working well, and he was in a good humour in consequence, we coaxed him into taking us inside and showing us with pride how the corn ran out of a big hopper up aloft to the revolving stones, whence it dribbled and trickled down through other hoppers and sieves, and finally into the sacks at the bottom. He even let us out on to the little platform behind at the top, where the steering gear was, and whence we had a fine view all over the country. Extract from an article by H.T.Crofton, Manchester City News, 1919 in which he reminisces about Lytham in the 1850s. Mr. Richard Swarbrick, of the Heyhouses, Lytham, has this week had ten sacks of oats converted into meal at the Lytham mill, which yielded seven loads, four scores, and three pounds, of a very superior quality. The oats were grown on a sandy soil, on Mr. Swarbrick's farm. 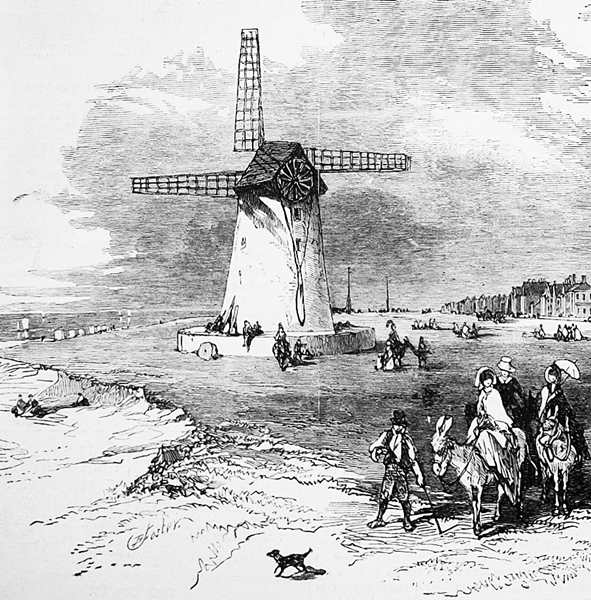 Lytham Windmill 1856, after the removal of the kiln. The miller's kiln, had been rebuilt in "Kiln Street" at the East End of Lytham in the 1840s but a fire in 1859 virtually destroyed it. Yesterday morning, between two and three o'clock, the drying kiln belonging to the Lytham windmill was seen to be on fire. An alarm was given and the neighbours assembled with cans, and, with great exertions, the fire was got under about five o'clock, but not before the roof and floors, and part of the walls, had fallen in. There were upwards of one hundred sacks of oats belonging to farmers, and a large quantity of oats from the Robert Henry, now lying on the Horse Bank, in the kiln at the time. 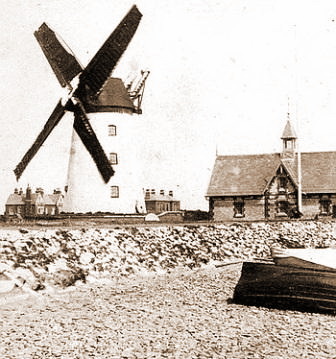 Lytham Windmill and new Lifeboat House in the 1860s. The windmill was again leased out by the Clifton Estate Office in 1863. Mr.Thomas Moore will show the premises, and further particulars may be had at the ESTATE OFFICE, LYTHAM. William Cookson was born in 1820 and his parents, George and Anne (Nancy), ran Eastham Farm. 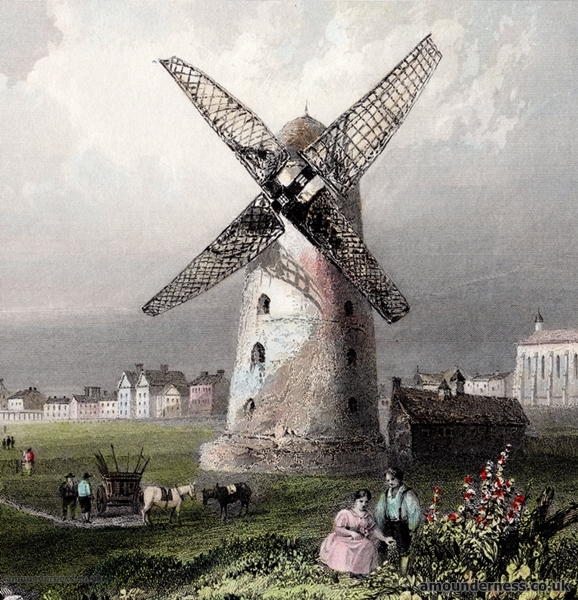 By the 1860s William was a "Provision Dealer" living on Station Road, Lytham and he probably took the lease of the windmill in 1863; he was certainly miller between 1871 & 1881. The coroner, Mr. Gilbertson, on Monday held an inquest at the police station, Lytham, on the body of a man named William Westbrook, who met with his death in an uncommon way on Friday last. 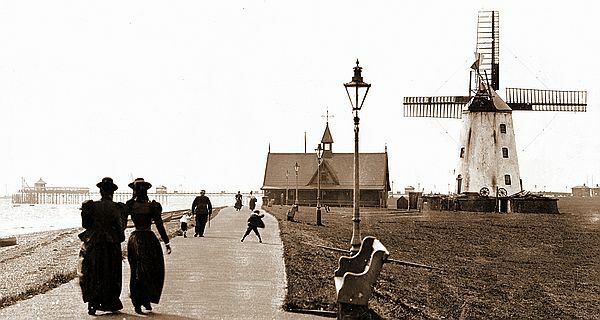 After having driven a lady to Lytham windmill from Warton, he got on to the balcony of the mill, and was walking round to go inside, when one of the sails struck him, rendering him senseless. He was immediately taken to the Infirmary there, but soon died, not becoming conscious again. After hearing evidence showing that the death was purely accidental, the jury returned a verdict accordingly. 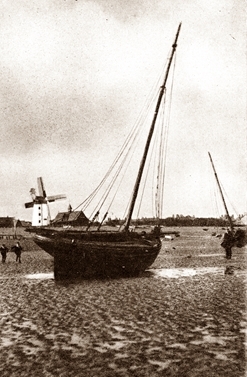 The windmill was again leased out by the Estate Office in 1881. William Cookson's son George was the tenant by 1881 when the advert below appeared in the local newspaper. John Dickinson leased the mill from 1881, and after him came Thomas Baines and then William Shuttleworth. William Swann was the last miller at Lytham, from 1895 until 1919. Advert for the lease of Lytham Windmill, 1881. The Dangers of Lytham Windmill. On Tuesday evening a boy named Nottingham received injuries at Lytham from which it is thought death will result. He was playing on the embankment round the windmill on the beach when he was struck by one of the sails. He was found unconscious in a pool of blood. He was conveyed to the hospital, where it was discovered he had lost a large quantity of blood, and suffered from a fractured skull and jaw and a lacerated neck. The doctor has little hope of recovery.